23 February 2016, at 7:00a.m. Injurious feather-pecking in free-range systems is an economic and welfare concern for the egg-producing industry. Recent work from A Bright, R Gill and TH Willings looked at how access to tree cover affected levels of plumage damage through pecking. Funded by McDonald’s UK as part of its Farm Forward programme and undertaken by the Food Animal Initiative (FAI), together with McDonald’s suppliers, the research found that high quality canopy cover can reduce the impact of feather pecking and improve hen welfare. Injurious feather pecking is an abnormal behaviour that consists of poultry pulling, plucking, and damaging feathers of other birds. It is associated with higher mortality and disease levels, and is a serious problem for poultry producers. In free-range systems, the study authors said, this behaviour can be a particular problem because there are no restrictions on birds' movements to prevent them from reaching potential victims. Previous studies had shown that greater use of outdoor space by birds correlated with lower levels of plumage damage from pecking. The research presents results from data collected from over 1,000 flocks from producers that supplied free-range eggs to McDonald’s UK between 2008 and 2013. Since 2008, farmers that supply McDonald’s UK have been required to provide a minimum of five per cent tree cover on their ranges in order to provide shelter and shade whilst encouraging hens to roam away from the hen house, which contributes to an improvement in the welfare of the flock. No more than half of the trees were allowed to be fast growing (for example pines or poplars), to ensure a wide area of canopy for poultry to shelter under, and the trees were planted with the outer branches 20-25 metres from the poultry houses to encourage the birds to move around. Ranging behaviour has been identified as a key factor in the development of injurious feather pecking. A Bright and colleagues looked into the correlation between poultry feather damage and, firstly, the proportion of the range planted with trees, and secondly, the proportion of canopy cover in the tree-planted areas. They found that less canopy cover within tree-planted areas resulted in significantly worse plumage damage at the end of lay. However, the proportion of the range planted with trees did not show a correlation with the condition of birds' plumage. 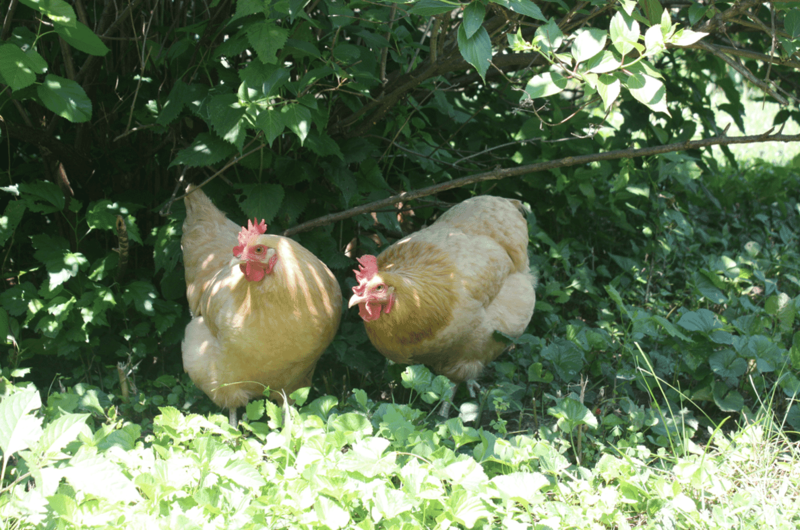 The authors suggested that this meant that it is the quality of shelter and shade provided by having a higher proportion of canopy cover that encourages hens to range, thus reducing feather pecking, rather than the area of the range planted with trees. They concluded that providing high-quality canopy cover to hens might be a practical way of improving feather condition in poultry. The different benefits of different tree species and how feather pecking changes as canopies expand over time might be subjects for future study. McDonald’s UK is a founding partner of FAI, and is committed to using its scale to help accelerate the adoption of sustainable farming methods that improve animal welfare and produce sustainable food. FAI provide actionable advice, applied research and state-of-the-art solutions that realise long-term business benefits. FAI’s approach is anchored in practical, on the ground experience; we innovate, operate and demonstrate best-practice agriculture on our own commercial research farms and within our partners supply chains. Since becoming one of the first high street restaurant chains to work with its suppliers to make the switch to free-range eggs over 15 years ago, the free-range egg market in the UK has quadrupled in size. Over the past six years, McDonald’s UK, their egg suppliers, The Lakes Free Range Egg Company and Noble Foods Ltd, and FAI and we’ve worked together to find commercially viable methods of improving animal welfare and egg quality on free-range farms. Our previous research found that by simply planting more trees on the ranging area, egg producers can reduce mortality rates within the flock and the numbers of egg seconds laid. Read the full research paper in the Animal Welfare journal by clicking here.